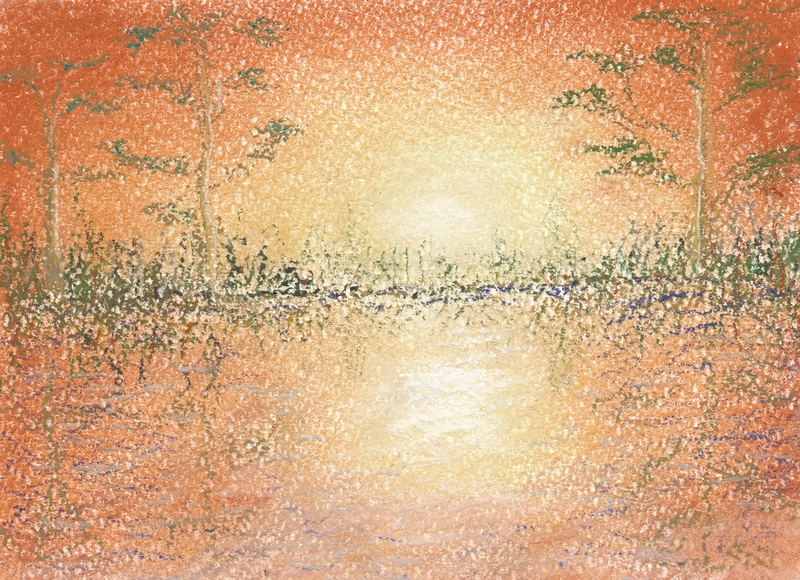 For this exercise explore your outside environment to find an interesting landscape to draw. It may be a row of trees, a perennial bed or a pond. You may find that a view without too much detail -- a simple field or hedgerow against the sky, for example, is easier to work with. In order for your landscape to come to life, you need to discover where your light source is. This is very important when creating pastel art. Working from dark to light is standard procedure with pastel colors. Let's talk about what is working well here. I like the way that the orange bleeds into light in the sky. Somehow that line of blue serves as an anchor on the horizon. This has a high contrast quality. I see a lot of potential in it! I really, really love this medium. I recall when I first started using it, that it took awhile to get the hang of your fingers as instruments. It's ideal for plein air, and I've even pulled off the road, and painted on brown grocery bags, to capture the 'just right' quality of a field in summer. So two things I might offer: first, my favorite medium is a bristol vellum -- the vellums will offer a smoother surface, so that you don't get the white pebbling. Colored pencil can be used on a variety of papers. Textured papers such as watercolor and pastel papers work very well. For more detailed and fine work, especially drawing technical illustrations, smooth papers will offer you the most successful outcome. 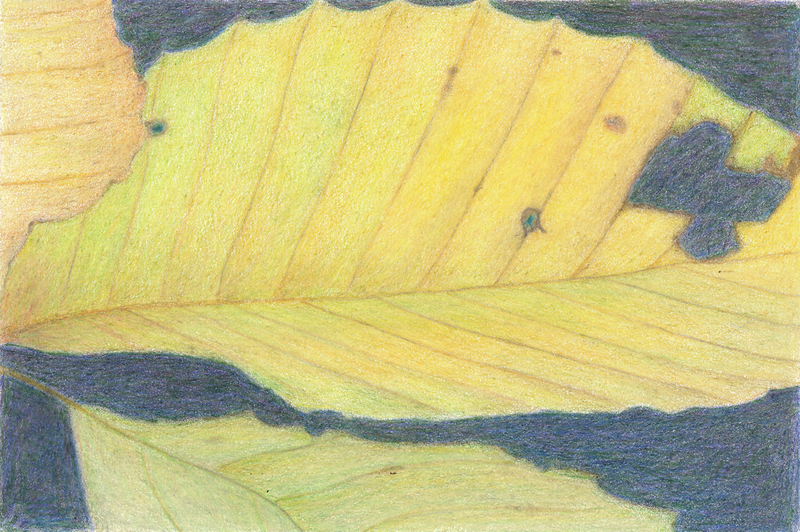 For this exercise we are going to illustrate autumn leaves. This is a great exercise for color blending and shading. This is one of my favorite exercises - seeing all the beautiful color combinations from your illustrations is a great joy. Start by finding a few interesting leaves. Do not be concerned if you are not in an area with fall leaves, you can refer online to interesting color combinations and you can use your imagination, or find an object in nature that challenges you similarly. The purpose of this exercise is to advance your skills in color blending and shading. Think about an interesting composition. You may include more than one leaf that can overlap. Terrific interpretation of this exercise -- I really like the way you've selected portions, instead of drawing the whole! Nice use and selection of color, and attention to detail -- especially those little idiosyncrasies that make a leaf an individual. Similar to the pastel, I'm wanting to see you press a bit firmer, or perhaps switch to a smoother paper, to eliminate some of the little white portions. I would find this a bit more satisfying to see a little less of that white -- in the background, to have a sense of solid, inky darkness that contrasts more vividly with the leaf in the foreground. Do you agree? 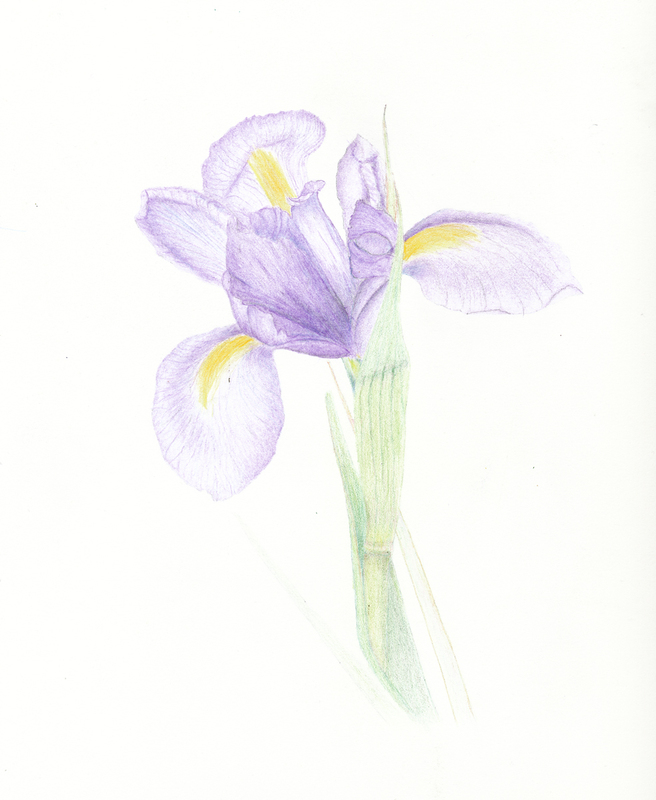 For this exercise we are creating a portfolio piece: Iris species with colored pencils. Irises are an interesting subject with beautiful flowers, making them ideal to illustrate with colored pencils. Irises can easily be found outside during the spring and early summer, depending on your region or location, or at a floral shop. If you live in an area of the world without this particular flower either available in gardens or at the florist, of course, feel free to identify a suitable substitute. How interesting! This is so soft, so subtle. I can't tell whether this is due in part to the scan -- literally shut off my lights and fiddled with the screen to try to see better -- from what I can see, I think this is a color pencil piece rendered with a tremendous degree of softness. You will want to be cautious that this soft quality doesn't slip into disappearance. While soft, you have still provided excellent detail, particularly in the petals -- you've captured the veins so well. Now wait a minute -- I was going to suggest that you consider, in the spirit of botanical illustration, adding in some leaves, perhaps a dissection, but again, in tipping the screen, I think I see some leaf shapes there. This is a funky scan, after all, I believe. Or are they merely hinted at? For this exercise, you will expand your opportunities and will create an abstract piece. This is a great exercise to advance your techniques with the various media we have focused on. It is also a great learning tool to explore the interesting ways in which to mix those media. We have addressed several different types of media from past assignments - pencil, pen/ink, colored ink, charcoal, chalk, colored pencil and pastels. For this assignment, be creative! Use this opportunity not to focus on technical details, but to explore interesting curves, shapes and mixed combinations. For inspiration, you may go outside in your environment to study certain plants. For example, the inspiration for the illustration below was corn. Spend at least an hour on this assignment. I look forward to seeing your submissions for this creative exercise! Sign, scan and submit. This is another interesting piece -- I'm casting about for the word that comes to mind, and I believe it would be evocative. Which media did you mix? 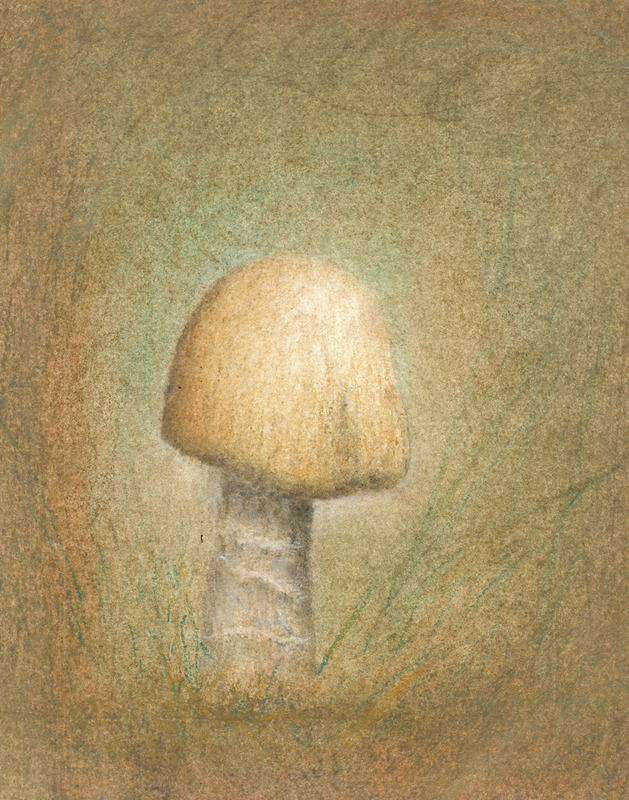 Pastel and color pencil...? From your recent forays into a diversity of media, you are really gaining a command of working with light. 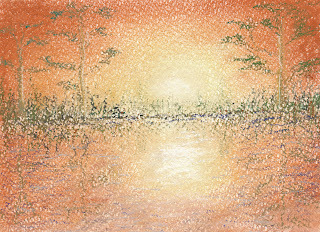 This piece has the feeling of light hitting a forest floor. It has realistic qualities, and yet, you have those more vivid lines drawn evoking blades of grass, and they have an abstract quality (in pastel or pencil? Can't quite tell). As I have viewed interpretations of this exercise, I have wondered what I would have done with it -- I haven't worked much with mixed media, though do love ink, color pencil and watercolor together. Nicely done! Think you'd go further with this...?